Today (while there's still June left!) 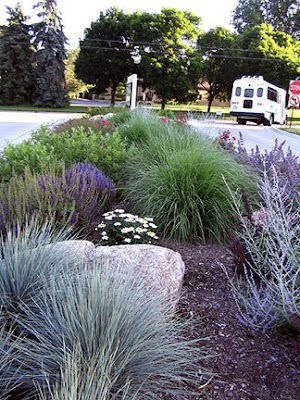 I'm participating in VP's Out in the Streets: June 2009, a project to showcase public plantings in your local area (in my case, Ann Arbor, Michigan). 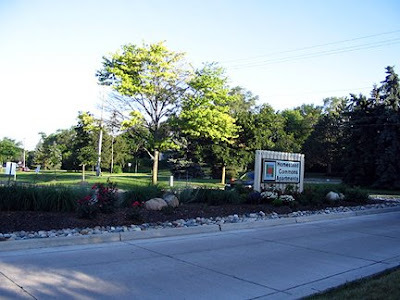 The first photo shows the plants in a median on Homestead Commons Drive, a cul-de-sac (that's French for dead-end) that leads to the Mallett's Creek library branch and Homestead Commons apartments. This is a mile wst from me, and I regularly visit the library on foot, by bike, or by car. The library has a rain water garden surrounding the parking lot as well as a green roof, but this median planting is maintained by the apartment complex. Notice all the water-smart plants! The photo immediately above shows the length of the median. My friend Peter lives a mile east down the street from me on Pittsfield Blvd., and there is a small traffic circle on that street. 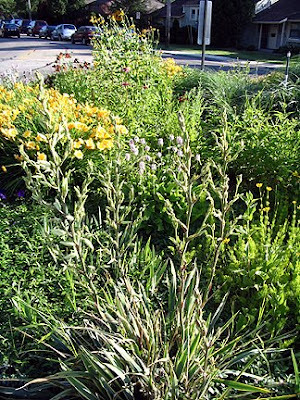 It is planted and maintained with all kinds of annuals and perennials by the condo association. In fact, there are lots of little flower plantings on corners and throughout the complex. Speaking of bright and windy, this is a planting along a road at Detroit Metro Airport (in Romulus, 25 miles east of Ann Arbor). You can't stop there to take the photo and despite doing two roundtrips to reach this spot, this is the best photo I got. You'll just have to trust me when I say it looks nice in person, possibly because the rest of the airport is largely concrete and unplanted. I'm working on other posts on a garden walk in Canton and a trip to Greenfield Village... Happy Monday! I'm so impressed with all those public plantings. I guess that's to be expected in a city like you live in but still, very nice. I do wish the city folks here could take a look at those and follow that example! I like that traffic circle one. The textures are wonderful. I had no idea two of your favorites were helenium and yucca. I like them very much too. I'm most glad helenium is ever so easy to propagate from cuttings so I keep planting more and more. Might have to send some up your way one day. You have a great Monday too. Monica those are really nice. 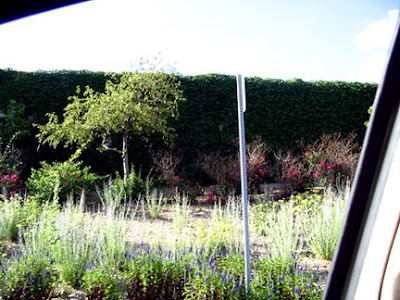 We have a few areas around the city that plant the medians--not many. To me little gardens like these are lovely. I'm not sure if the average person notices. Monica, I'm so glad you posted these photos. I've been wanting to join in, but so far haven't had the opportunity to take some good photos of plantings around here. All of these look lovely, and it's nice to see that some people are taking the time to beautify areas that would otherwise be neglected. I really like that first median planting. Areas like this can really make a drive about town a little more pleasant. I really like the hues in the first pic. It looks vibrant and peaceful at the same time. We have a mayor that loves to landscape our city, but unfortunately everything looks rough from all the heat right now. Looks great Monica! It's nice to live in a town/city where care is taken to beautify so many public areas. Good for Ann Arbor, doing xeric plants. How cool that the library has rain and roof gardens! The traffic roundabout planting looks lovely! What a great idea to showcase public plantings. Thanks so much for taking part! I might try to get around and see if there are any plantings here. I doubt there are any as nice as these. I like the use of the big rocks too. 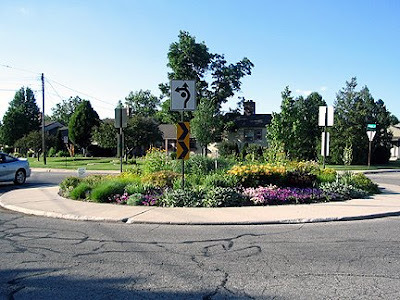 I especially like the traffic circle planting. It looks lovely. Yay for the public planting in your neck of the woods as it looks fantastic, all of it! BTW I've branched out in designing garden tools as well. Would really like your opinion on my brandnew hedge trimmer. I do love the median plantings. It makes so much more sense than having to mow. So much more water wise and less upkeep--and pretty to top it off! Nice tour of your surrounding Monika! OK, I'm another impressed one. This is the second post on public water-thrifty plantings I've seen, it's so encouraging to know that it's a (pardon the pun) growing movement. And posts like this will nurture that, because all the plantings look great. Great idea, Monica (I should post our village gardens that we spend hours/years tweaking). Will be looking forward to your Greenfield Village post. Happy July (but where did June go)! Public plantings are great and I love that first shot. I did see some good ones in England but they were 'through the bus window'. I will have to keep camera in hand in my local travels. Where I live a restaurant owner has decided to plant and care for three or four little spots in the adjacents streets. You know, these tiny spots they give for trees to grow in. It looks lovely and I procure to take these streets when going somewhere. On the other hand, my mom, who is a great plant lover doesn't put pots on her windowsills at the streets because she's afraid of vandalism. I guess that's always a risk. Sehr schoen! Ich bin auch oft erstaunt, wie schoen manch oeffentliche Plaetze bepflanzt sind. Leider, wie bei dir, kann man oft nicht stehen bleiben um ein Foto zu machen. Great idea and wonderful publicity for Ann Arbor! :-) Thanks for giving us another glimpse of your city.